Slow, dull, and everything else that this movie should not have been. The Harry Potter movie series has made a ton of money all around and received exceptional levels of popularity, but it has never been all that great. yes, there have been some entries that soared high about the rest (most notably the third film: Prisoner of azkaban), but as a whole, most movies are just mediocre and are more about little unimportant details than they are about the big picture. that’s because what you have here is a series of seven films (make that eight, since the last one is broken up into two parts and two different movies), with only one real villain. that means the villain has to survive all the way until the very last film. how boring is that? it also means we can’t even see the villain fight in every film, because if we did, he would have to lose over and over again until the final movie. and him losing would make him seem less threatening as well as make the movies just feel repetitive. so instead, we don’t even see him in a number of the films, and when we do see him, it is often not for a fight. having no climactic fights or a lack of them, is a major problem of the series. at least in the first few films, there was a different villain in each movie who worked for voldemort. and so by the end of the movie, that villain could be killed. but then that pattern came to an end, and soon whatever villains existed only popped up here and there and weren’t to be killed at all until the final film. another problem with the series was the matter of choosing a director. the first two movie were helmed by christopher columbus, an excellent choice. he did wonders with the first movie and establishing the world of the harry potter. the second movie wasn’t nearly as good, and so he bowed out. at that point the series took on the approach of brining in a new director for each movie (much like the mission impossible movies have done). the third potter movie was directed by alfonso cuaron (an amazingly smart decision), and then the fourth one by mike newell. they both turned out to be two of the better movies in the series. and then after that, as if the producers had gotten lazy or tired of choosing a new director for each go around, they decided to settle on one single director to make every one of the remaining films. a guy named david yates, whose only previous directing experience was in tv movies. that decision basically put a curse on the rest of the series. there would not be another great harry potter film. yates made order of the phoenix, which just might be the worst of all the films. than he made the half blood prince, and now the two deathly hallows movies. they are all pretty bad. at least with half blood prince, by the end of the movie we start to get some kind of resolution and direction as far as where the series is heading. there are some major revelations about professor snape, as well as some shocking events that happen to one of the main professors at hogwarts. 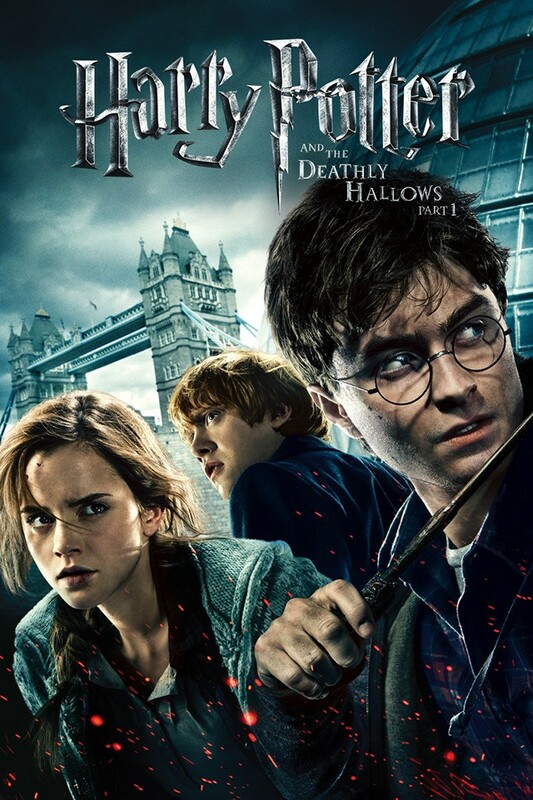 no such luck in deathly hallows part 1.
instead, the movie is so ridiculously bad that it doesn’t even bring the kids to hogwarts once in the entire film. instead, the three of them (harry, ron, and hermione), spend the complete length of the movie running around trying to find these hawcruxes. what is a hawcrux? it’s some sort of object that voldemort has put a piece of his soul into. he’s divided his soul into a whole bunch of them, like maybe seven. and so like a scavenger hunt, the kids just need to run around from place to place looking for them. it’s not a very promising premise, and to make matters worse, the movie doesn’t even follow through on it’s ideas or attempt to make it’s plot line work. instead of spending the movie chasing after hawcruxes, they really just find one and then realize that they have no idea how to destroy it. so they travel around with it until they can learn what to do with it. it’s beyond stupid. especially since the hawcrux turns out to be some little piece of jewelry or something that they wear around their neck which turns their thoughts into evil ones and their feelings into anger and resentment. sound familiar? this is a blatant rip off of lord of the rings, where characters would wear a ring dangling from their neck that would tamper with their emotions and make them evil. it is pretty much the exact same thing here. the movie is two and a half hours long and for the first three quarters of that duration pretty much nothing happens at all. ron wears the hawcrux and turns evil and ends up leaving harry and hermione, who now go on as just the two of them. they come to an old village in the snow where harry looks through windows of the lit up homes to see memories of himself as a child. clearly this is right out of a christmas carol with scrooge traveling back in time with the ghost of christmas past, looking through windows, and seeing old memories. there is a cool animated storytelling section which ends up being the absolute best part of the film. it’s only about two minutes long, but it is so great simply because it’s something different, away from these boring characters in this terrible plot. and after that animated sequence the movie does start to pick up a little bit. the death eaters show up and bring harry and his friends somewhere and at least we have something of a climax. there’s nothing great here, at the end, but for the first time in about two hours the movie has started to show some signs of life. 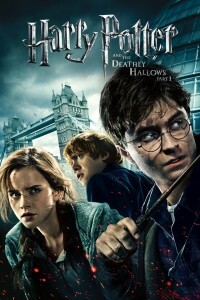 there are lots of problems with harry potter and the deathly hallows part 1. For one thing, there is very little action or excitement. it really seems like they took one book and tried to make as money out of it as possible by breaking the book up into two movies. and they made the first movie extra long just so people wouldn’t say, “they stretched out as much as they could to barely make the length of a feature film.” so instead of doing that, they threw in as much boring crap as they could to have a movie that went over the length of a feature film and was that much worse because of it. i’m not buying it. they could easily have cut out over an hour of this movie and probably put it together with the content of the next movie to make one single film, just like the final book. instead, they waste our time here with this awful mess. yes, there are some moments that are artistic, and yes, the end does pick up a little, but three quarters of this movie were an absolute waste and the problems could have easily been avoided if not for a great deal of greed by the producers and people who decided to make one book into two long and boring movies.